I conducted a demo on four horses that people were kind enough to bring to the Sheriff’s Posse Building on Tuesday evening, September 13, 2011. 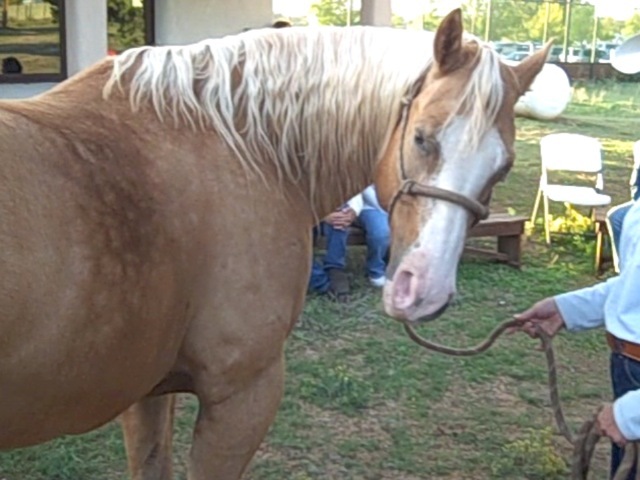 The first demo horse was Dorado, a Paso Fino who had gotten his hind leg caught in a fence. He was found three hours later by his owner and received veterinary treatment right away. It has been two months since that accident, and he is still a little tender on that hind leg which was trapped in the fence, but in very good spirits otherwise. What I noticed about Dorado was that several of his thoracic vertebrae were raised up like a hunters’ bump, but in front of the pelvis rather than right on it. He was also very sensitive about his hindquarters, having had them stretched in that position for such a long time. The raised vertebrae is not great– it means that the ligaments have separated from the spine. With an injury such as this, a horse that has had his entire limb stretched and hung up experiences pain and dislocation all the way up the limb and into the pelvic area – not just in the fetlock area where the vet stitched him up. Dorado seemed to favor the left hind at a walk but not at the trot. I worked on the shoulders and neck to effect change in the spine as well as directly on the spine and ribs. In future I would work very holistically to help the pelvis and hind limbs align as an injury like this can cause other damage. 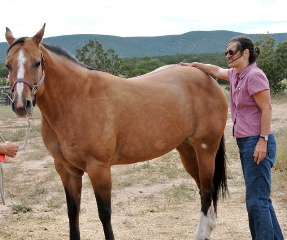 The next horse was Lily, a Tennessee Walker mare whom I had seen some months ago and at that time her vet had diagnosed her with a stone bruise. She was really stiff all over her body and had a hard time lifting her legs for treatment. This made me think there was more going on in her body. She had her shoes removed and improved with Ortho treatments. After I stopped treating her, some weeks later she began to collapse on the rear. Her owner took her to the vet who diagnosed her with Cushings and attendant laminitis, and prescribed corrective shoeing. She looks very stable now. Cushings is a disorder of the pituitary gland which causes the gland to produce too much hormone, evidenced by a thick hair coat even in summer and other immune system imbalances. With immune system problems, there are often signs that seem benign such as a “stone bruise” or slight lameness, wobbly gait or lack of energy. It isn’t until something really apparent happens that a more accurate diagnosis is made. I worked on the neck to influence the gland and help it come into balance. In a full treatment, I would also increase circulation in all limbs and address the endocrine system. 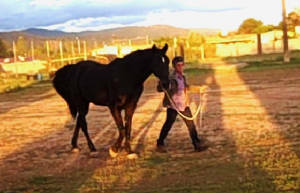 The third horse was Amigo, a QuarterHorse who did not pick up the right lead at a canter. He showed stiffness in the hindquarters, and was unable to cross over his hind legs in a circle. The hindquarters also did not track evenly. I worked on the sacrum, leg lifts into the hindquarter area, and the hamstrings. His hips moved more evenly and he crossed over a bit better after some treatment. More treatment for this horse would focus on the hindquarter and how the rest of the body might be compensating. Another horse collapsing behind was a Tennessee Walker who had had hock and stifle injections this summer and since then has mostly been traveling well. The hocks were inflamed and I noticed that she had a lot of movement throughout the body – but it was disconnected movement. The hind legs were heavier than the fore, indicating imbalance in the way she is relating to the ground. 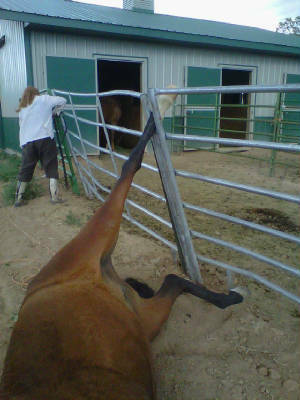 I worked on the circulation in all four limbs and some direct contact with the hocks. The collapsing on the hind end can mean a lot of things, so again a holistic treatment would be in order, to help the central nervous system operate more smoothly and achieve more integration. This mare was very tight in the cervicals and poll region. 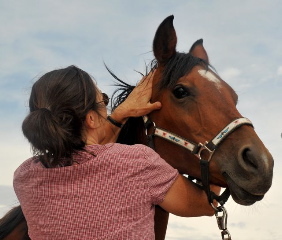 The owner reported the mare was showing signs of distress by throwing her head and holding her neck and head high and stiff, also being a bit rowdy on the trail. 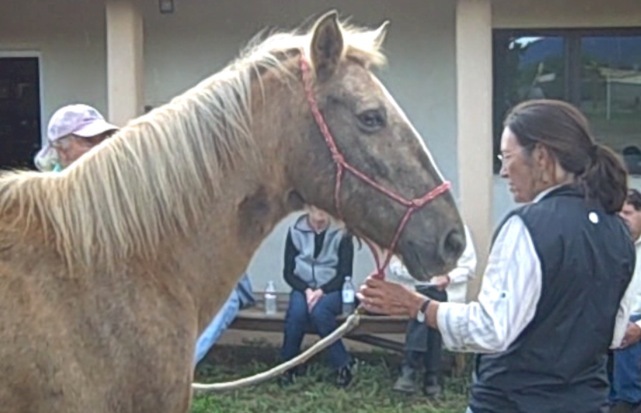 The releases through the cervicals and poll helped her relax and allowed her to drop her head and neck. Releasing through the sacral/caudal spine.